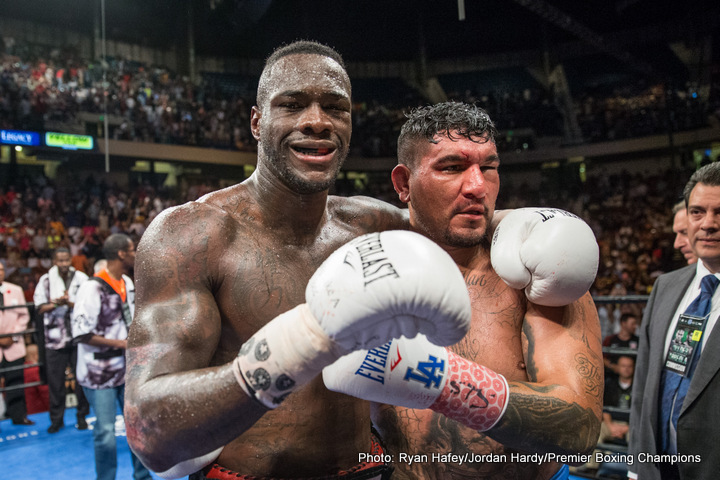 What next for Deontay Wilder, Chris Arreola? WBC heavyweight king Deontay Wilder came out of last night’s fight with Chris Arreola with a number of things: a win, his fourth title retention, respect for an Arreola who was “as tough as I always thought he was going to be,” and, perhaps most seriously, a broken right hand and an injured bicep. Wilder, who improved to 37-0(36) with the 8th-round corner retirement win over a game and at times crazily tough Arreola, must now see a specialist, before he will know how soon he can fight again. Wilder threw plenty of right hands up until the 4th-round knockdown over Arreola, but after that, he used his most lethal weapon only sparingly. Wilder showed great heart himself in fighting on through the injury – actually two injuries – and he said later he was in great pain. Arreola was busted up and his trainer Henry Ramirez, looking to the future, decided to pull his warrior out at the conclusion of the 8th-round. Arreola gave it a shot, proving those “experts” who said he would be gone inside a round or two know nothing about him, but he was well beaten. The big talking point is what next for Wilder, of course, but Arreola, now 36-5-1(31) told the media afterwards how he himself plans to “keep pushing,” even if he acknowledged that last night was probably the last time we would see him in a world title fight. Arreola, annoyed at some of the things former KO victim Eric Molina said about last night’s fight – Molina calling Arreola a quitter according to the Mexican/American – called him out during the post-fight presser. That’s an interesting fight between two contenders who have both shared the ring with Wilder; Molina being stopped in the 9th-round by the WBC champ in his first defence (as well as a return meeting of a fight Arreola won by 1st-round KO in 2012). But fans are naturally more interested in what Wilder does next. Wilder said last night, and he has said many times, how he wants to become undisputed heavyweight champion. And to this end, Wilder said he absolutely wants to fight both Tyson Fury and Anthony Joshua – but the WBC boss questioned whether they want to face him. Arreola can testify to Wilder’s power – as well as to his excellent left jab – but until his injuries have healed, Wilder will have to continue calling out both Fury and Joshua. It’s quite an ironic twist how Wilder, who stated last week how he hoped to send Arreola to hospital, had to take a trip there himself after last night’s fight. Hopefully there will be no long-term damage to Wilder, arguably the most exciting of the current world heavyweight kings.